Come enjoy tropical Bowling Fun from the convenience of your own home! Knock down special pins to get the highest score you can!Come enjoy some Bowling Fun!Come enjoy tropical Bowling Fun from the convenience of your own home! Knock down special pins to get the highest score you can! Listen to adorable music as you go through ten frames of fun. 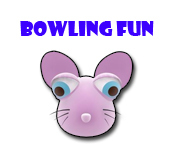 Avoid obstacles and rack up the points in Bowling Fun!